By Sean Barron | May 5, 2018 at 12:04a.m. Amanda Leone sees a direct and powerful connection between her community-service efforts and career choice, but four years of college likely separates the two. Nevertheless, her higher-education pursuit received a huge financial boost, courtesy of a $7,000 scholarship. “I’ve always wanted to be a teacher; I love kids,” the Ursuline High School senior said about her desire to attend Kent State University in the fall and major in early-childhood education. 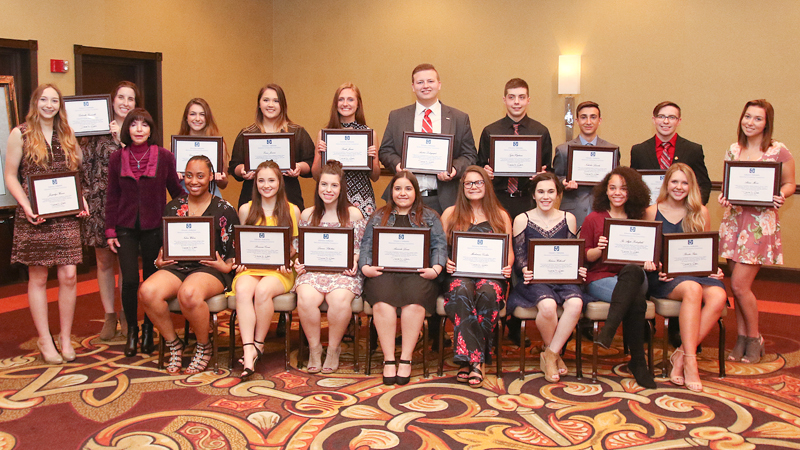 Leone was among the 20 seniors in Mahoning, Trumbull and Columbiana counties awarded scholarships of $7,000 each during the Edward J. DeBartolo Memorial Scholarship Foundation luncheon Friday at the Boardman Holiday Inn on South Avenue. “The goals of the foundation have been to reward worthy [Mahoning] Valley students with the opportunity to pursue their education,” said Denise DeBartolo York, who, along with her husband, Dr. John York, awarded the scholarships. The awards were based on recipients’ academics, financial need and community service. The students also had to write essays and needed letters of recommendation from teachers, guidance counselors or principals, noted Shannon Rovnak, the DeBartolo Corp.’s executive assistant. Leone, who is carrying a 3.5 grade-point average and whose career ambition is to teach kindergarten at a Catholic school, said she’s proud of being part of Ursuline’s community-service class. Her outside volunteer efforts have included working with children at St. Rose Church in Girard, spending time with residents at Woodlands of AustinWoods nursing home in Austintown and reading into a microphone magazine and other articles to people who are blind, she explained. “I’m shocked, to say the least. It’s a big honor and is really going to help me out in college,” said Sarah Jarvis of West Branch High School said about her scholarship. She has set her sights on attending Ohio State University. Jarvis’ intention is to enter OSU’s meat-science program, with a career goal of becoming a meat inspector with the U.S. Department of Agriculture, she explained. A decisive factor in her choice was having shown livestock animals for nine years at the Canfield Fair as part of her 4-H Club experiences, said Jarvis, who’s maintaining a 3.8 GPA. DeBartolo York, whose mother was a teacher, said her parents have always placed a high priority on education. She also praised the recipients for their work in school and beyond. The 20 winners were selected from more than 400 applicants for the $140,000 in scholarship money, noted Bob Hannon, president of United Way of Youngstown and the Mahoning Valley. The DeBartolo Foundation has awarded more than $1.1 million in scholarships over the past 21 years, he added. June 28, 2011 12:01 a.m.
May 16, 2014 12:05 a.m.
May 28, 2015 12:02 a.m.
May 17, 2013 12:15 a.m.
May 19, 2017 12:07 a.m.